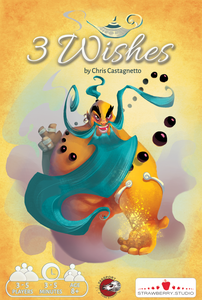 In 3 Wishes the world is still good and so you automatically have lost, if you are not able to collect these three wishes until the end of the game. Collect wishes? Yes, that's true. 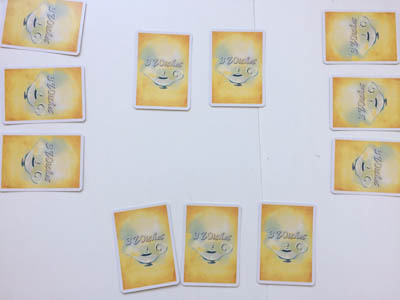 3 Wishes is a small card game and each card represents a wish. It is one of the new small games by STRAWBERRY STUDIO, a company of NSKN games. A maximum of 18 wish cards for five players, reduced to 12 cards for three players is all you need. Each card is unique and belongs to one of the three wishes. Beyond that, each card has a value of 1-4. At the beginning of the game, you shuffle all cards and remove one of them, without revealing it. Then two cards are placed face down in the middle of the table and three cards are dealt to every player. These cards must be placed faced down in front of them and accessible to all other players. A player may look only at one of these cards in front of him, the two other cards remain unknown for him as for every other player. Then the game begins. On our turns we can either peek at any card in front of us, switch two cards on the table (you can take these cards from you, the stack or from other players) or shuffle the three cards in front of us. As said, it is our aim to gain the three wishes. So it is our task to find three cards of different wishes and collect them in front of us. Once you have reached this (or think you have reached it), you can declare the end of the game and as a result every player reveals his three cards in front of him. 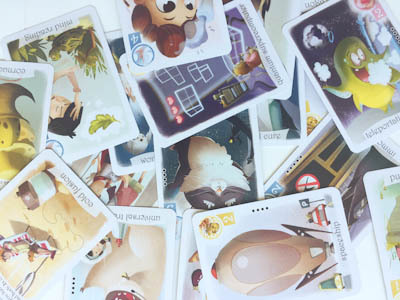 If you were successful, you sum up the values of your cards and the player with the most points wins the round. 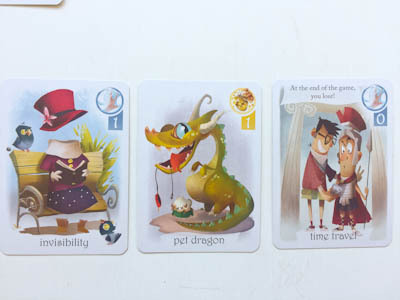 So it is not only important to look for the three different wishes, you also have watch out for cards with high values. You can imagine, that all of your fellow players will do the same, and, as a result, you often have to decide between going for a short round or looking for better cards. It all depends on the actions of your opponents. If you have the feeling that they will end the game soon, it is safer to play it safe. This applies all the more when you have one of the special cards: there are two cards with additional winning conditions. If you have both of them, you automatically win the game. With one of them, you can still double your total, if you are able to meet the conditions of the card. But there is also a time travel card. This card is our Jackass and you will loose the game, if you have the card at the end of the game, nevertheless how many points you have collected.